An array of RGB hexadecimal color values to use in the gradient. The placement of the bevel effect. An array of alpha transparency values for the corresponding colors in the colors array. Valid values for each element in the array are 0 to 1. For example, .25 sets a transparency value of 25%. The angle value represents the angle of the theoretical light source falling on the object. The value determines the angle at which the gradient colors are applied to the object: where the highlight and the shadow appear, or where the first color in the array appears. The colors are then applied in the order in which they appear in the array. The amount of horizontal blur. Valid values are 0 to 255. A blur of 1 or less means that the original image is copied as is. The default value is 4. Values that are a power of 2 (such as 2, 4, 8, 16 and 32) are optimized to render more quickly than other values. The amount of vertical blur. Valid values are 0 to 255. A blur of 1 or less means that the original image is copied as is. The default value is 4. Values that are a power of 2 (such as 2, 4, 8, 16 and 32) are optimized to render more quickly than other values. An array of RGB hexadecimal color values to use in the gradient. For example, red is 0xFF0000, blue is 0x0000FF, and so on. The offset distance. Valid values are 0 to 8. The default value is 4.0. Specifies whether the object has a knockout effect. A knockout effect makes the object's fill transparent and reveals the background color of the document. The value true specifies a knockout effect; the default is false (no knockout effect). 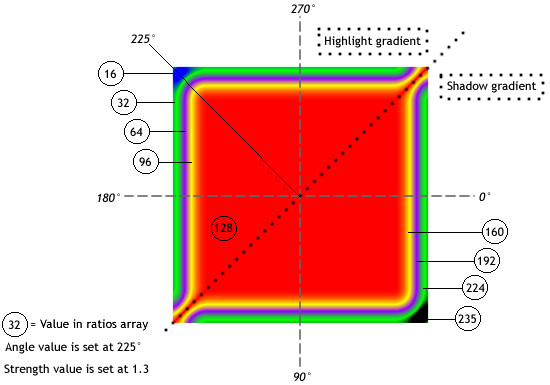 An array of color distribution ratios for the corresponding colors in the colors array. Valid values for each element in the array are 0 to 255. To understand how the colors in a gradient bevel are distributed, think first of the colors that you want in your gradient bevel. Consider that a simple bevel has a highlight color and shadow color; a gradient bevel has a highlight gradient and a shadow gradient. Assume that the highlight appears on the top-left corner, and the shadow appears on the bottom-right corner. Assume that one possible usage of the filter has four colors in the highlight and four in the shadow. In addition to the highlight and shadow, the filter uses a base fill color that appears where the edges of the highlight and shadow meet. Therefore the total number of colors is nine, and the corresponding number of elements in the ratios array is nine. The first four colors range from 0-127, increasing in value so that each value is greater than or equal to the previous one. This is the highlight bevel edge. The fifth color (the middle color) is the base fill, set to 128. The pixel value of 128 sets the base fill, which appears either outside the shape (and around the bevel edges) if the type is set to outer; or inside the shape, effectively covering the object's own fill, if the type is set to inner. The last four colors range from 129-255, increasing in value so that each value is greater than or equal to the previous one. This is the shadow bevel edge. The strength of the imprint or spread. The higher the value, the more color is imprinted and the stronger the contrast between the bevel and the background. Valid values are 0 to 255. A value of 0 means that the filter is not applied. The default value is 1. Declare global variables to define the square and the filter. Calls the draw() method, which uses methods of the Graphics class accessed through the graphics property of Sprite to draw a gray square. Assigns myFilters to the filters property of the GradientBevelFilterExample object. This applies all filters found in myFilters, which in this case is only filter.